Firefighters had to work for five hours to extinguish a planned gorse fire which got out of control on Tuesday, the Isle of Man Fire Service has said. Crews from Kirk Michael and Ramsey used "hose reels and beaters" to tackle the 530 sq ft (50 sq m) blaze on moorland near Druidale,a spokesman said. The remote location meant some officers had to get to it on foot, he added. Station Officer Matt Tyrer said anyone planning "a controlled burn should contact the emergency services first". "Weather conditions including wind strength and direction should always be considered," he added. 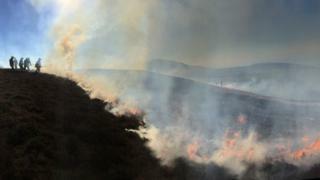 The fire happened on the same day as an "apocalyptic" blaze on moorland in West Yorkshire and a large gorse fire on Arthur's Seat in Edinburgh.